I was excited to hear that Demi had released a new single out. She is rising to the top faster than I expected her to. Demi began her climb with the single "Skyscraper" which was written by Toby Gad,and co-written by Kerli and Linda Robbins. I don't want to go into details of why she stopped and suddenly came back because everyone knows the story basically, but it seemed that this single took a bit to be released but it's because of her work on the X Factor. 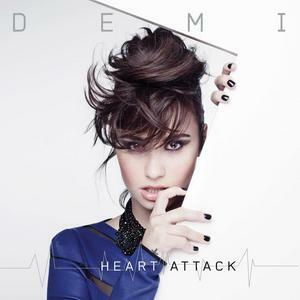 The Meaning of Heart Attack in my opinion: The meaning of the song isn't too complicated to understand. Basically she's saying that she likes this guy (obviously) because he makes her want to do her nails, her make up, wear high heels(Don't wear the ones McCarthy wore from SNL) and act like a girl. Yes, guys some girls go to lengths to impress you. However, the lyrics suggest that she's afraid to fall in love and if she ever fell in love it'd be a complete shock to her (or have a heart attack, but not literally of course!) The lyrics that stuck out to me the most was the opening "Putting my defenses up, because I don't wanna fall in love, if I ever did that, I'd think I'd have a heart attack"
The Music Video: I was disappointed in the video. Usually Demi has really well constructed videos and videos that portray the meaning of the song very well. However, this video did not do as much as I'd hope it would. I'd expected something more like "Give Your Heart a Break" instead of well something that is kind of Kelly Clarkson-ish. I don't hate the video, but I dislike how it was made. I tried to match up the scenes in an artistic sense and the most I got from it was the walls were her defenses going up and maybe the black lines in the background were her heart strings. So I went and conducted some research to see what other peoples' opinions were or the meanings they were handing out. Dana Ward of Clevver TV explains the meaning behind the slick black oil hands and states that it represents how much the person effects her. Then it clicked, yes the black lines the white background do represent her heart pulse and it makes much more sense. So am I still disappointed about the music video? Yes and no. While I do understand now what the artistic view points are about the video, I still would have love to see a story being told with the song. Of course, since Demi did sing this live while shooting, it'll be hard for her to sing and act it out at the same time. The song overall: I love it. I have to say it seems more like an inner battle with herself than it is with the guy and her. She's wanting to impress him but at the same time she wants to put her walls up and defend herself from being hurt. The concept was good but I just still have issues with the music video because at one point and time it reminded me of another video that was made. That happens though. I'm so-so on the music video. I will say that I do like her style a lot. this was somewhat new for her so I'm very impressed.